The journal invites articles in various branches of science -- physics, chemistry, biology, mathematics, computer science and engineering and emphasizes on a lucid style that will attract readers from diverse backgrounds. Articles on topics within the undergraduate curriculum, especially those that students often consider difficult to understand, new classroom experiments, emerging techniques and ideas, and innovative procedures for teaching specific concepts are particularly welcome. The articles are of various categories: general articles, series articles, concise texts in article-in-a-box, classroom and nature-watch, research news, book reviews, face-to-face;theme articles in ‘Classics’ or ‘Reflections’ and information and announcements useful to students and teachers. Each issue highlights the contributions of an important scientist. 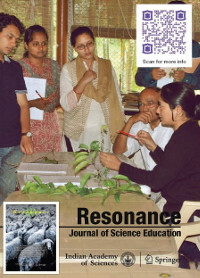 Resonance – Journal of Science Education is now distributed in print outside India and online worldwide by Springer, co-publisher of the journal together with the Indian Academy of Sciences. On Springer, Resonance – Journal of Science Education (www.springer.com/12045) is part of SpringerLink, one of the world's leading interactive databases of high quality STM journals, book series, books, reference works and online archives collection. Print subscriptions within India and open online access will continue to be served from Indian Academy of Sciences.